For years now I have cringed each time I've gone to pick up soap, shampoo, toothpaste or other hygiene products at the store. The knowledge that nearly every name brand product contains Sodium Lauryl Sulfate or some related chemical has plagued me since I was a kid, when a friend of mine told me that her uncle "puts the foam in soap" and that it was a "very bad chemical"... At the time I had no idea what she was really talking about, but I did manage to grow up with a healthy aversion to the mystery foamy chemical so commonly found in household hygiene products. Sodium Lauryl Sulfate, or SLS, is a common chemical in the cleaning industry, used in higher concentrates to break down industrial greases and oils. Various studies indicate that when SLS is used on the skin it does break down the oils, but it also penetrates and is stored in the eyes, heart, liver and even brain where it showed long term retention. Yuck! In addition to that, when stored in the eyes it has shown to cause cataracts in adults, and to inhibit eye development in children. They even use SLS on laboratory animals to irritate the skin so that they can then apply and test healing agents. They also have discovered that when SLS combines with Nitrites it can form cancer-causing carcinogens. Urg. Is it really worth a bit of foam in your soap to threaten your skin or even your life? Still more interesting is that the use of a corrosive like SLS and it's relatives can cause permanent damage to the lipid-regulating glands that issue protective oils. 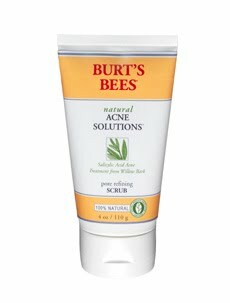 This can cause either a lack of oils or a surplus, and I suspect may be the reason I have battled acne for much of my life. This past month I have made an effort to complete my switch to non-synthetic cleaners and hygiene products. Sure, they cost a bit more (or WAY more in the case of cosmetics) but in my mind they are definitely worth it. To share a bit of what I have started using, here are some photos and links to the web sites. 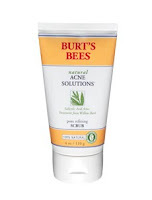 My greatest discovery has been the Burt's Bees acne solution which has willow bark derived salicylic acid. The Burt's Bees Radiance is a great body wash with a peculiar consistency, but I noticed that it uses "Royal Jelly" and to be honest I've got conflicting morals surrounding the use of royal jelly for anything other than the bees themselves. I'll have to read up some more on it before feeling like this is something I'll buy again. It was interesting to seek out a shampoo that I could use, too. A lot of shampoos hide SLS derivatives in their ingredients under mysterious names (often with a long, winding name in parenthesis after them). 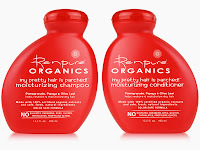 I finally stumbled upon Renpure Organics, which appears to have all natural oils and very little foaming action. It took some time for my hair to be "O.K." with the new shampoo, and I went through some weird phases of oily hair, dry hair, and then one day it all just evened out. 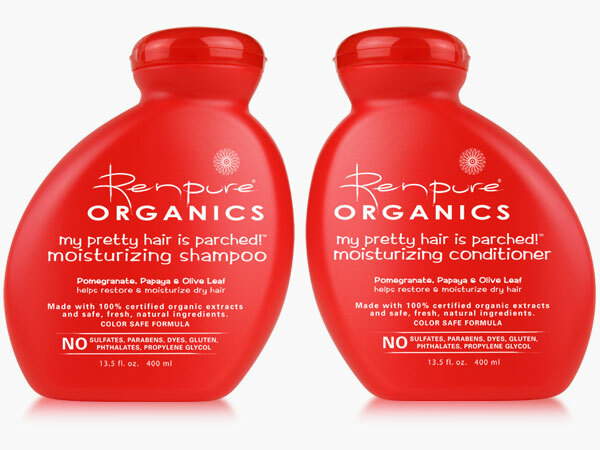 I even find with Renpure that I am able to go longer without washing my hair since my follicles have figured out how much oil to produce. I use the "My pretty hair is parched" shampoo and conditioner and it's GREAT for sunbleached I-work-on-a-farm-in-the-summer-sun hair. O ne other product I made an effort to switch was toothpaste. Tom's of Maine toothpaste is a staple in many households, but I have to admit I was unimpressed with most of their toothpastes, finding them artificially sweet, strangely gooey and outright gross. I finally Trader Joe's All Natural toothpaste, which is comparable to Tom's, but their sodium bi-carbonate (baking-soda) based is an all natural paste that really tastes/feels all natural. According to my husband, it has the consistency of wet cement, but I can't help but feel completely clean and free of chemical residues after brushing. Woo! I also use a Tom's of Maine deodorant (though I admit to losing it recently and finding an old tube of name-brand deodorant to use until it shows up again). 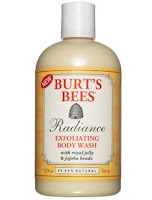 Which brands of hygiene products do you use and why? The one barnyard creature that demands more financial weight than any other is also the one causing the largest carbon footprint and the most wintertime stress. The pig. The propane tank is one of my biggest frustrations, living where and how we do. Last winter, our first winter here, we flew through a tank of gas with little awareness of what we were doing or how energy inefficient our house was. It was two days before Christmas 2009 that I panicked because our tank was almost empty and we were going out of town. They rushed a out to fill us up and drain us dry in one fell swoop. It still makes me shudder to think of the bill we received after that. They also suggested we schedule our next fill for early February 2009, just six weeks from then. Ugh. I vowed then to do my best to be as independent of propane as possible. It was December 10th 2010 that we finally thought we should call to have them fill the tank. After months of learning to seal cracks, plastic windows, install storms and burn wood (as well as thaw an occasional pipe) we have cut our propane use by a massive percent, using only 60% of our tank in nearly a year's time. I'm a Glove Winner over at Chiot's Run! 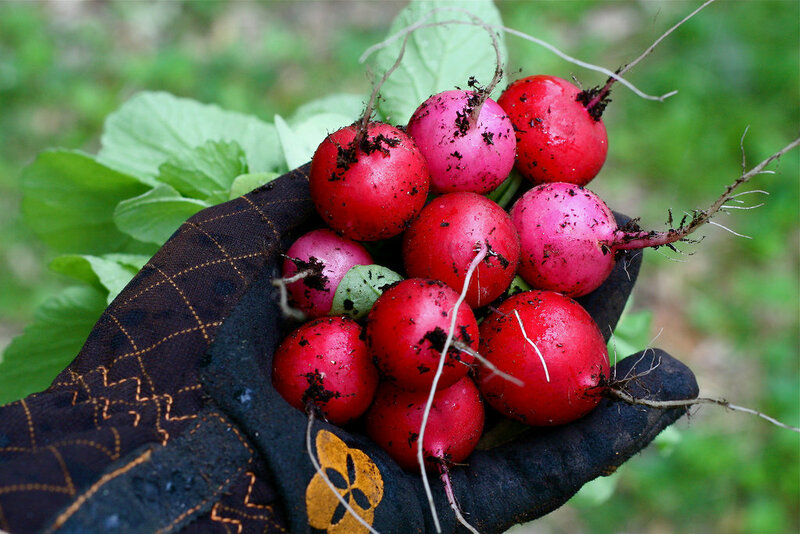 My currently favorite blog is definitely Chiot's Run an organic gardening blog written by a woman in NE Ohio, which is the same zone as myself and often gets the same weather, so the things she writes are very relevant to myself. I strongly encourage anyone who enjoys my blog to check hers out. It's full of all sorts of great information, diverse topics and the best part is that she continues to blog regularly through the winter season, unlike many blogging gardeners. My morning ritual now begins with a pre-dawn glance to see if she's written anything new, and two Fridays ago she posted a random drawing based on comments in order to win a pair of Ethel brand garden gloves. I don't often try to win in drawings, but these gloves look fantastic so I commented (discussing my current favorite garden gloves - the West County gloves) and a week later I received an email stating I'd won, by being the randomly selected #110th commenter on her blog! Hooray! The last time I won anything it was free tickets and a backstage pass to see Pennywise - a pop punk band. I was 13. Hahaha. Anyway, Ethel gloves look great. We'll see if they live up to my lifestyle, though. I tend to burn through garden/work gloves just about as fast as I burn through riding gloves at the horse farm. This is peculiar since I still have hands the texture of sandpaper and cracks across my fingers like the Mojave desert... I guess I use my hands a lot, huh? 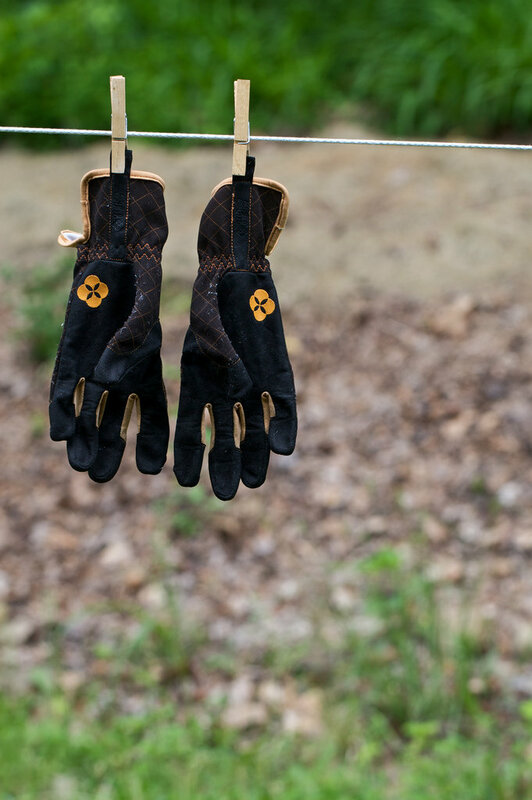 The gloves claim to be hard-wearing, and they're very fashionable. I can't wait to sink my Ethel-gloved hand into the soft squishy soil of spring! It's really too bad that since bringing home the sheep my digital camera battery has had no charge and I haven't been able to locate the charger... Every photo I've posted in the last few months has been taken with my phone, and so now that we are into winter my phone is pretty freaked out by the contrast between the snow and pretty much anything else around. I spent a quite a bit of yesterday morning with the sheep. Yesterday I noticed one of the sheep was leaving me little mini sheep pies instead of sheep pellets, if you catch my drift. In the world of sheep this is referred to as scours, and can only mean bad news. Scours is a general catchall term for loose stool in ruminants and can indicate all sorts of things including viral or bacterial infection, or high parasite infection, or basically anything to upset the carefully balanced flora in their rumen (the first chamber of their crazy complex stomach). I'm starting to feel more comfortable with my little mini-flock though and I didn't panic (an amazing new habit I'm trying to start). I quietly ushered them into their holding stall, where there is a particularly nice corner I can use to catch and examine them and one by one I checked for signs of scours (or bloat - I'm paranoid). After checking them all and finding no signs of loose stool on anybody I decided I'd be the paranoid shepherdess and I set up camp for a while on the stump of a tree I felled earlier this year. I cut this log to a perfect height and angle specifically for sheep watching, and it's really come in handy since I can perch quietly and they quickly forget me there. After about fifteen minutes I had seen everybody relieve themselves at least once and everything looked normal. I'm going to chock it up to the fact that they got a bit more alfalfa than usual in the morning when my dear hubby mistook course alfalfa hay for grass mix. Everybody's eating, drinking, pooping, peeing, baaing, running and has a decent Famacha score, so I'm fairly content that it's nothing to worry about. It's difficult to keep a level head when this kind of thing happens, after everyone livestock-oriented that I meet seems to say "You have sheep? Whew! Good luck with that!" or "Sheep are the one creature on earth constantly trying to DIE."... Haha. If that is the case, panicking surely isn't going to help, so I'm doing my best to breathe and take all things "sheepy" relaxed and easy. So Christmas day has come and gone. I spent the bulk of the day with my new in-laws, scuttling from place to place following the holiday rituals of my husband. This includes seeing a movie on Christmas afternoon, and this year's movie was "True Grit", the new Coen brothers' movie. Right, folks. This movie is fantastic! It quickly climbed onto my top five list. Whether it'll hold up to multiple viewings, I still don't know, but ... Jeff Bridges is a truly amazing actor, and Matt Daemon has shown he's more than just a lunk (with a little help from the Coen Bros writing!) I was so blown away by this film. I know it's a remake, but from what I hear it's much closer to the original novel than the original film. Pretty much everybody but the die-hard John Wayne fans is going to enjoy this, though. I mentioned before that I was hesitant to post information about the handmade Christmas gifts I've been working on. I still haven't gotten together with my family, so I'm restricted as to what I can post, but I did give my brother-in-law his Christmas gift. He has an iPad and a love for pink and bunnies, so I set to making him a case for said gadget from grey felt. I haven't needle felted since college so it was fun to try again. I think I enjoyed it enough to make it a regular thing, even. I've been toying around with starting an Etsy store for some time now, and I've often thought I'd like to get back to my fibery roots to do so. I'll play with the whole felting thing for a while more, now and we'll see what comes of it. I know I intend to post my weaving there as well, so I'll just let it play out naturally. Any time I force myself to pick up a new hobby or endeavor I quickly lose interest so it's probably better if I just pretend I'm not trying to do so! Anyway, we had a wonderful Christmas (except Connor, who apparently shouldn't be left alone with a rawhide bone... ew) and I hope you did too! 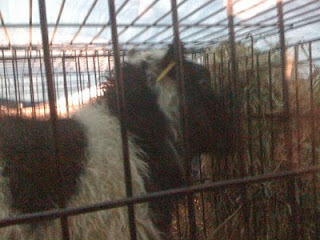 Very early Christmas morning was spent giving gifts to the earliest risers on the farm: the animals! The dogs got their rawhides, the sheep got a pine branch to chew on, the ducks got an extra tub of warm water, the horses got an extra flake of second cut alfalfa hay each, and the cat? The cat got to finish chewing on the mouse he had already caught and killed when I found him this morning. This past week has been full of apathy, panic and productivity. At any given time I admit I feel as though there is too much, or not enough, ahead of me to do before Christmas. This year I have decided to make the bulk of my Christmas gifts. Okay, so I make this decision every year, but this year I've finally done it! Except for my husband, I have made gifts for... everyone, now that I think of it. My husband understands my mad dash to handmake everything, so I promised him that his handmade gift would come after Christmas. This year I managed to get myself motivated and I got some holiday decorations up before the actual holiday itself. I tacked up my traditional white pine garland and decided that, while I usually garnish it with red bows, this year I wanted something eco-friendly and dual purpose. My answer? Winterberry! Winterberry is a (cultivar of a) native plant in Michigan, also called Michigan berry. It is a true holly and is deciduous, losing it's leathery leaves each fall. What remains are these fantastic red berries that the birds just adore. I found a woman at the farmer's m arket who specifically grows winterberry for Christmas arrangements and it's the only thing she sells. She told us all about the plant, and about the cultivars she uses in her planting. My last bit of outdoor decoration was to hang a wreath on the barn door. Our house faces away from the driveway, and is set a good 1/4 mile back from the rode, so I wanted to add a bit of festivity to anything I could and the barn seemed like a great place! The winterberry pops better in this photo. So the house is decorated, the kettle is laced with spices and oranges to boil on the woodstove, the tree is lit and I am inside by the fire considering the last few remaining gifts to make. I can feel the house trembling gently as Jeremy tries his hand at splitting a two foot thick log for the first time, and every once in a while I can hear the "Tok" of a log splitting easily (though more often, I am hearing the "tink" of the wedge being driven into a difficult log. Bummer). I can't wait until after the holiday to post all of my latest projects and production photos. I love to share my handmades here, but since a number of my family members read this blog I feel a bit spied on this time of year... heh. One thing I can admit to: I used ric-rac on one of my family-members' gifts- bright red ric-rac! Harrison quickly discovered the ric-rac while my back was turned and decided that, though I needed it, it was no longer mine (it seems like cats often do this). I had to distract him in order to retrieve it, and he tried to snag it at least two other times while I was sewing. What a booger! So while yesterday consisted of sewing, and double boiling, today will consist of hammering, nailing, sawing and trying desperately to learn a new tool on Christmas eve in order to complete my final gifts for family. Merry Christmas Eve, everyone, and I hope you all were better at finishing gifts than I was! A few days ago, the county started working to clear their power/phone lines of tree branches. Of course this translates to butchering our beautiful pine windbreak, as well as three of our ancient and barely-clinging-to-life apple trees and I tried not to be terribly upset about the whole incident. I understand, but I don't have to like it. What I reeeally don't like is that the county workers left their lunch garbage in the orchard! Oooooh. I've only I'd seen them do it, I'd have given them a crazed, fuzzy haired and wild eyed piece of my mind! Anyway, I noticed that our older ewe, Ingrid, began bleating incessantly on the same day. Of course it took me nearly three days to notice the correspondence, and in the mean time I was fairly concerned. Ingrid is a very quiet and skittish lady. She has very rarely bleated since arriving, though I cannot say the same for Gertrude (the name we've given the morrit ewe). At first I was only mildly concerned, but as the first day progressed into the next and then a third I became more and more concerned. She was standing at the gate baa-ing nearly every 5 seconds, for hours on end! She was still making trips to eat and drink, but I was pretty much at a loss! After sending a message to Laura over at Queso Cabeza Farm (the farm we bought the sheep from), Laura confirmed my suspicion that this behaviour was previously unheard of for Ingrid. In her message, she mentioned that Ingrid originally came from a flock of hundreds of sheep, and then when she was at QC, she was still in their flock of several tens of sheep. It occurred to me then that the men from the county were using chainsaws and from a distance those chainsaws sounded exactly like distant baas! The next day, the county men finished their work and Ingrid became her silent self once again. It's amazing how much I learn daily from my sheep. They continue to be a source of amusement and education in both shepherding and my own limitations. Hah. Alas, Michigan has thrown us for a loop. Often our Decembers are full of false alarms, snow storms and freezing rain, but southeast Michigan rarely gets a good freeze before the winter solstice. This past week has taught me never to assume Michigan's weather predictable! The snow started last Sunday, which wasn't terrible. Snow is always welcome this time of year, but the rest of the week proved to be absolutely frigid! Tuesday was littered with gusts of 40mph winds and wind-chills of -16 degrees. The actual temperature reached a whomping 14 degrees. Of course it was Monday night that was the real problem. Monday night the overnight low was only 4 or 5 degrees and it was on this night that I forgot to put the thermostat up a bit before bed to keep the house warm enough for... well... habitation. It was set at a reasonable temperature for your average Michigan December night, but the terrible cold managed to lick into our crawlspace and freeze not only our pipes but our boiler as well! Tuesday morning was full of nerves and crossed fingers. Renting can be a bonus at times. The maintenance man here is fantastic. He's an older gentleman who is pleasant and very competent. We managed to get heat blowing into the crawlspace with a space heater, and after some time things began to thaw out it became apparent that one of the seals on the boiler had broken. Lucky for us it wasn't a major repair, and the boiler itself was unharmed! Baseboard heating is so inefficient it drives me crazy. Our plan for the future is to find a way to keep the boiler/water heater area on the porch nice and warm, while heating the bulk of the house heated with wood. I've been sealing the front porch with plastic all morning. We've got to get the house cleaned up before holiday company, and so far I've made headway on pretty much every room in the house, but really none of them is up to my standards yet (which are pretty low to begin with) which means I'm feeling wholly unproductive. Hah. I'm taking a break now to blog, munch a bit of lunch, and watch the first bit of the BBC Pride and Prejudice... I'm such a fan of this series! Of course I'm a huge fan of anything Austen. The same day as the frozen boiler fiasco, we had various other troubles around the farm. I had noticed a huge red-tailed hawk scoping out the area a few days before, and I'd screamed and flapped her off knowing she would be back soon. Last winter we had a hawk attack on poor Tonks but she survived after a few days inside, a bandaged wingbase and a serious puncture wound to the chest. I'm hoping to avoid another attack this year, but I never figured the hawk would be so desperate so early in the season. I'm pretty sure a combination of the foxes' emigration back into the orchard, and the harsh early freezes, is responsible. The cottontails are scarce and the squirrels even moreso. Last year the orchard was full of life through the beginning of January, now it's just a skittering of birds through the trees, and the squirrels never show themselves unless the sun is out. The hawks are obviously having trouble adjusting because Tuesday afternoon we had a very close call between the ducks and the hawk. I think she fumbled when the ducks scattered and so they all made it to their coop in time. The ducks will be spending the remainder of their winter in their fenced and covered pen, much to their dismay. Unfortunately this wasn't the only mishap to befall the ducks on Tuesday. Fleur is the one of our ducks that I generally consider intelligent. She has a great personality and is by far my favorite feathered farm animal. Well, I was pretty sure she was intelligent, but on Tuesday afternoon, after the hawk attack, Fleur decided to bathe in her water bucket. Any other day this would've been fine, but with the air more than twenty degrees below freezing she was quickly coated in thick sheets of ice. Jeremy heard her flapping about and looked out to see her frozen to her water! He dashed out to grab her and brought her quickly into the house, where we bundled her in a towel and sat her by the wood fire. I wasn't positive she was going to make it. She was shaking and fairly unresponsive, but after some time she warmed up and started looking around. Within an hour she was on her feet and demanding to be let out. This is the same duck that regularly sneaks into the house whenever I leave the door open for more than a few minutes. Huh. Anyway, today she is happy and bathing in her water again, but the temperature is a balmy 19 degrees so she's doing A-O-K! Well, I had today off because of the intense cold and winds. I may very well have tomorrow off as well for the same reason, and Wednesday I will have off because my maternal grandmother has passed and we are getting together for some family time Wednesday night before the Thursday morning funeral. It's amazing how quickly a week's planning can change. I spent this morning keeping busy. I cleaned quite a bit and reorganized some things. I brought up the rest of the last of our split wood and even considered splitting some more for about three seconds before a gust of wind nearly spilled me and my logs across the snow. The horses stayed in today, and the ducks and sheep of their own accord. Every once in a while if there is a drop in the wind, I'll peer out to see a lone sheep or duck sneaking out of their havens to steal a bit of food. They have food inside as well, but at least in the case of the sheep there is better food (alfalfa) outside than there is inside (grass hay). I'm a little bummed that I haven't received many seed catalogues yet. In fact, I've only received one! Johnny's Selected Seeds is a great company, but as I'm trying to go almost all heirloom this coming year, it's not terribly helpful. I'm desperately waiting for Baker Creek Seeds, Seedsaver's Exchange, Comstock-Ferre and Seeds of Change. I wish that Oikos Tree Crops had a catalogue, but they are very small and also very eco conscious so it doesn't surprise me that they don't. Jeremy and I bundled up and trundled into town to the Saturday farmer's market yesterday. Our mission was simple enough: to get a small Christmas tree. We found one quickly enough, after falling in love with it's odd Victorianesque shape. I had hoped to find a few other things while we were there, but aside from buying another calendula lip balm from a wonderful local bee farmer, we didn't pick up much. We came home and decorated the tree while listening to some of Arvo Pärt's Berliner Messe. After hanging our assorted ornaments I realized that for the most part our tree has either native bird ornaments, or star wars ornaments. Hahaha. I guess that seems about right. Our tree has the most adorable homely shape to it. The table loom has been a great loom for the house we're in now, but I miss my floor loom which is still in storage - and dressed - at a friend's house. This morning brought a four inches of wintery surprise for all of us. The weather forecast had been correct, for once, and the old North wind had dumped a blanket of white over us during the night. When I awoke, the snow was still falling fast and I managed to stay in bed an extra hour or so before the lady-ducks' cries finally drove me to get out into the cold crisp air. This is a shot from the window that is level with our bed. I roll over and peer out over the barnyard every morning. My first chore was to hay the sheep. They seemed more polite today than usual. I think they're developing a distinct pecking order and there is a lot less shuffling and headbutting in the morning when I feed them. It's fun to watch their excited faces as they root around in the hay pile to find the bits of alfalfa that I mix into their grass hay. Spoiled much? After the sheep, I trudged over to the duck coop amidst quite a racket. If the sheep have become more polite, the ducks have become less so. I swear each morning, Fleur and Tonks get louder and louder. Poor Fleur has the squeakiest voice, too. She had an upper respiratory infection earlier this year and, while she seems to be over it, she still has a squeak when she quacks. Poor dear sounds like cleaning an oboe reed! they'd never leave the coop! The ducks despise the snow, and would rather stay inside than venture out. The blanket of snow has coated everything now. It was peaceful and quiet in the gardens, and I was grateful for the thick frosting because for once I was able to focus on the accomplishments of the last year, rather than the unfinished jobs and projects now masked by the snow. Here, I close with a few additional photographs. The orchard is thickly frosted and only the occasional skittery steps of the voles and field mice show that life exists beneath the snow. Basil loves the snow and drives us all crazy with her frantic yapping and bouncing and nipping and... you get the picture. Yesterday seemed like a very winter doldrum-ish sort of day. It started out cold and dreary and I was not in the right mental place to get anything done. I was curled up on the chair beside the fire and had no intention of moving for the duration of the entire day. Jeremy found me that way and tried to suggest a few activities to get me going, but I was grouchy and in a funk and decidedly against all productivity. Then the sun poked her head out and everything changed. In a whirlwind of madness I grabbed the sewing machine and quickly threw together some curtains for the living room window, something I'd been meaning to do for days. They're simple white flannel- something to let the light in but to keep what remains of the draft out (after an inside and outside layer of plastic haphazardly taped up). Of course, making curtains wasn't enough. I tromped into the kitchen to find something to do and spotted a small bag of brussel sprouts calling out to me. I've never pickled anything before, but last week I had pickled brussel sprouts at a local restaurant and it was a life changing experience. After googling a few recipes, I decided to try a sweet recipe of my own. I didn't have a lot of the spices needed, but I knew I wanted a sweet pickle so I used the recipe's ratio of sugar/cider vinegar/water/salt and added my own spices: something akin to curry! When I finished with those, I quickly scanned the kitchen for anything else to pickle and my eyes fell on a lonely head of romanesco that had been given to us by a lovely gentleman over at the Tantre Farms booth at the farmers' market. I had no real use for it, but it was a nice gesture. Why not see what it's like pickled? The whole experience was a great one. The curry spices add a great, warm flavor to the cider vinegar. These pickles were perfect right out of the pot. I can't wait to taste them after they've been in the fridge for a week! They're really quite beautiful, as well! My final project for the day came to me just as the sun was going down. For days now I've been putting off warping my loom because, due to my lack of a warping board, it usually entails stringing up warp all over the house to get it measured out and prepped for sleying. In an random "I can do that!" moment I dashed into town for some dowel rod (stopping for groceries as well) and came home to make myself a not-so-scientific warping board. It's for my own use so it doesn't have to be all that accurate in measuring warp length as long as I know the measurements to some degree. I used 5/8ths dowel and drilled holes in a frame of four pieces of furring strips (3'x4')... When I finished, I wound my warp in less than 10 minutes and by standing in the same place! Winding on a warping board is a wonderful and meditative experience. The sheep at dawn, tucked in their stall. The sheep have settled in nicely and are getting used to their new routine. They are a lot smarter than people give them credit for, and their sense of smell is superior to any creatures I've ever handled before. They know the exact content of my pockets as soon as I come to the field, and if I've got bits of apple there is no way I'll make it out of the field with any of those bits remaining! I spent the other day letting them get to know me by sitting on an overturned bucket in their field for some time. The little moorit is so amazingly bold that she regularly marches right up to me, looking me in the eye, and checks to see if I have anything of interest. She is also the first to the gate, the first to baa when she sees me and the first to stomp at the dogs when they sniff at the fence. She's a very strong personality, I just hope she uses her personality for good. She did headbutt my hand away from her grain the other day, and I admit I didn't know how to respond so without thinking I flicked her lightly in the nose (like I would with a horse). She looked thoroughly disgusted that I had touched her without her permission and head-high tromped over to inspect the other sheep's grain. I'm hoping this won't be something she tries with me often. Sunrise from the barn looking through the windows into the sheep stall. My little moorit, who is yet without a name, demanding a bit of apple. You can see the ram in the background happily hanging with his ladyfriend, Ingrid. I'm hoping after spending some time watching them this morning that the moorit is near heat. She usually shoves the ram away, or avoids him altogether, but this morning she practically peed on him. In horses I know this is a come-hither move... not sure about sheep! Anyway, he shoved his nose into her in the rudest of ways and she looked back at him like "Well?" He then lifted his little lip (I didn't know sheep do this! Horses do it too!) and sniffed and sniffed and sniffed... I'll have to keep an eye on her later today to see if he decides to make his move. Such drama! Every homestead needs a good range, right? I have to admit that while looking through my homesteading resources I often day dream of owning a cook stove rather than a wood stove, one with a range and an oven, and maybe even one of those steamer racks on top. I also admit that until yesterday I had figured our wood stove was not fit for cooking on. It isn't the sort built with a range at all, and has a simple flat surface on top without a designated spot for cooking. The advert claims that the flat spot on top is a "Raised Griddle for cooking" but really it's just a flat area with not a lot of heat conductivity. It's a Dutchwest 2461, which is I believe distributed through Vermont Castings: built for heating, and not so much for cooking (or so I believed). The best part about it though is that it's got a catalytic combuster which allows it to burn cleaner and hotter. It occured to me yesterday that really with the right cookware you can cook on anything that produces enough heat. I put an enamelware (I couldn't find our iron cookware) pan on the wood stove and set a bit of water in it. A few minute later the water was nearly gone, so I figured it must be getting some heat. I let it sit another few minutes and then splashed water into the pan and it Sssssssssssizzled away! Hooray! Hot enough for eggs at least! I managed to scrounge up some eggs and a few scraggly slices of bacon and I cooked my first meal on the wood stove. I'm going to poke around on the forums today a bit to see if I can come up with some tips for what I can and cannot cook on a stove like this. The griddle obviously gets hot enough to stew on, and would do better with iron cookware since it would distribute heat more thoroughly, but I wonder about it's ability to fry. The eggs took quite a long time to cook through. I'm hoping by the end of winter to be cooking on the wood stove any opportunity I can! It was very satisfying. This is where I aim to be on Thursday (the day they let us noncommittal attendees come instead of making us pay for the whole week). I am excited to see the various seed companies, including Baker Creek, Johnny's Select and Seeds of Change. Also setting up at the trade show is Nourse Farms, which is by far the best bareroot berry supplier I've ever come across. Well, I am finally a happy shepherdess at last! Accompanied by my good friends, Lauren and Heather Shelley from Roheryn Farms this afternoon, I trekked out to Olivet Michigan to Queso Cabeza Farm to pick up my sheep. They were waiting for us in a stock trailer and soon after arriving the breeder let me know that the badgerface ram that I'm borrowing had actually already bred Ingrid, the older larger ewe, while sequestered in the trailer. Queso Cabeza is a great little farm, and I was happy to have the opportunity to see their wonderfully diverse flock of Icelandic sheep. I absolutely oggled at the amazing color variety in both their sheep and their beautiful Llamas. We got the sheep loaded into the two dog crates in the back of the truck and tarped them over to keep the wind down on the drive home. This photo is a shot of Ingrid, looking a little paranoid in the back of the truck as we drove. She recovered quickly once we arrived though, and even let me get close enough to touch her (though I didn't take advantage of her proximity) while I was finishing up the gate that goes between their barnyard and their first pasture. The three were happy to explore as soon as we got them out of the truck. The moorit ewe was easy to get into the field, the ram, not-so-much. He was very very upset to be taken away from Ingrid who was still in the truck. She is in season and so he is pretty obsessed with her. I lifted him from the truck and got halfway to the gate when he started leaping around in my arms! I quickly lowered him and managed to flip him onto his back. We kind of improvised the rest of the way to the field, but he was unharmed except for perhaps his dignity. Obviously he was unharmed because much to our amuzement, within seconds of Ingrid's release into the field he started trying to mount her again... and again... and again... we lost count after roughly twenty times. It was hilarious. He is a ram lamb, so he's pretty sure he likes this new thing he figured out! Ingrid was polite, and then a little less so, and then finally she spun around and shoved him off... She's a sweetheart, even if she is shy. The moorit is the exact opposite of Ingrid. She is bold, confident and incredibly curious. She stopped by to visit me multiple times as I did odd jobs around their field, and when my DH let the dogs out, she marched right up to the fence and stomped at them! The dogs were pretty unimpressed, though I did notice Basil seemed more focused than usual. The sheep were equally unimpressed once they figured out that the dogs were just dogs and not something more threatening. When dusk came and I went to bring the sheep into the barn I started fretting because I'd waited until near dark to bring them in. What if they're a handful? I should've put that light up in their stall so they'd be more confident going into it for the first time. What if I can't get them in the barn? Oh no! Well, after years of ducks and horses, figuring out how to herd these guys with my body language was pretty easy! I know it won't stay this easy, as they get more and more used to me, but for tonight at least all it took was a few flails of my arms in varying directions to get them into the barn yard, and then Ingrid took it from there. She must've smelled the hay or their grain or something, or maybe she just read my mind. She marched boldly into the barn, into the sheep stall and started right in on the hay. Woah! I'm sure it won't be this easy every time, but it was welcome after a long day and a few moments of fretting. I just discovered the MERL, which is obviously a place I have to visit should I ever make the trip to England. The Museum of English Rural Life has put together a few short films about rural craft and it's history. You can view more of the films HERE. Early and primitive crafts really fascinate me. This is a beautifully pieced-together spot about two traditional hay rakemakers in England. 16 TEETH - Cumbria's last traditional rakemakers from Rii Schroer on Vimeo. When we think of separation anxiety in pets, the first species to come to mind is definitely the canine... Dogs suffer through our absence in many ways, from chewing, to pacing, to ulcerating their stomachs! I had no idea that cats could have separation anxiety to the degree of a dog. Don't tell Harrison I just compared him to a canine, please... I value my life. This past week we traveled to New Hampshire to visit my parents in Keene. We were packing and getting ready a few days in advance when I noticed Harrison acting strangely. He wasn't eating well, and he was constantly hiding under chairs and tables. I was mildly concerned, but he seemed okay otherwise so I put it out of my mind. It wasn't until just minutes before we were going to leave, at 7pm (planning to drive over night) that Jeremy began to pack up Basil's dog crate. The metal bars make a terrible scraping and clanking sound every time you collapse it, and within seconds Harrison was tearing around the house, landing finally in the broom cupboard in the kitchen, yowling and shaking. Oh boy. We (I, really) debated a while and finally decided to take him to the emergency vet in Plymouth. The vet (Named DuFramboise which was awesome... hehe. Raspberry.) was SUPER helpful. I love when vets acknowledge that I know a thing or two about animal diagnostics. She went over some possible things, including a newer developed diagnosis of a nonspecific urinary tract irritation that they're finding more and more in cats (male, altered usually). She did a rectal, a urine check and a bladder check. This was literally two weeks after Harrison's trip to the vet for a colon impaction that we got to release using an enema. I figured it was a recurrance. Long story short, we toted our adorable little kitty to New Hampshire with us, and he enjoyed the car ride! He and Basil are very close, and they sat together the whole way. Apparently our cat is more unique than we ever dreamed! Yeesh... This is in addition to the walking-on-hind-legs thing that he does, the comes-when-he's-called-even-if-he's-sleeping thing, and various other non kitty things... We're convinced he's an alien cat and we're part of his bizarre social experiment. I found a fantastic video of a man using a scythe to mow hay. My hope is that the holiday season can bring me a snath and blade, though it might kill me to have one without being able to use it until spring! We've had our first snow, which surprisingly has stuck for the first time in several years. Usually we get a few goofy days of snow-melt-snow-melt before getting a good layer established, but this year we launched right into winter over night, December 1st. You can see Basil on the left resting between burst of puppy zoomers around the yard with Connor. I had forgotten how much she loves the snow, despite being a adorably skinny little waif that shivers the moment temperatures drop below fifty. The dogs always approach a change in season with renewed enthusiasm for life. I love to watch them exploring the fruits of the season, whether it's discovering a fresh pile of deer droppings to do disgusting things with, or sniffing out and marking on a new rabbit warren (more on that sometime in the future- we're not supposed to have warrening or burrowing rabbits in Michigan but as I said, convention is often to the wind). Winter is full of new discoveries for everyone. My last few days have been a harried race to complete the various preparatory tasks for the sheep. I've reenforced the fence, built two gates, found a supplier for grass hay, done a few field walks searching for any remaining burdock plants, and basically done everything I can do to be ready. My favorite of the tasks has definitely been building the gates. I admit I got tired of dropping another $50 every other day for new gates, so I managed to glean a wood-and-wire gate design off of an old photograph and quickly set to building both a large gate for the sheep barn and a small gate for the barnyard-to-pasture pass. The photo to the right is of the new large gate which will allow me to keep the sheep under shelter in the really nasty weather, without keeping them cooped up in their stall. It'll allow for airflow and protection, should we get any of Michigan's special ice storms this year. This photo before finishing with the welded wire on the gate. It still needs a trim and some more staples/nails on the left end. This gate will also help me contain lambs in the spring, and separate the sheep should I ever need to do so. I used the small holed welded wire as opposed to the more formidable 4" woven wire since the Icelandic breeder mentioned that she's had lambs get their heads stuck in the large holes. Since this may be a common place for the lambs I figured it's better to keep them safe even if it does mean having to replace the wire annually. The fencing is now all in place, gates safely secured and I am very happy with my planning and design. I have five tiers to my sheep lot, the stall, the shelter, the barnyard, the pasture and the welded wire fence I installed earlier this year (which won't be stretched until spring's thaw) around the yard. Each area that the sheep are in is surrounded by at least two layers of fencing to keep them in (and very very far away from the neighboring golf course) and more importantly to keep predators out. You may or may not be able to see the plans I sketched in one of my sheep books, but I have two small pastures planned adjacent to the main one. I hope to be able to lead my sheep easily with promises of treats so that I can rotate them through the orchard using the electronet fencing I purchased from Premier1. The new four-leggeds come home tomorrow afternoon! 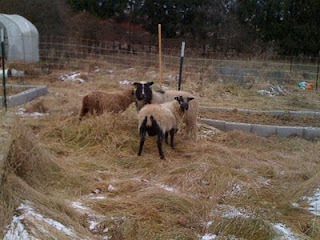 Eight year old Ingrid, a lamb ewe and a lamb ram, who are as yet unnamed. I'm sure I'll remedy that quickly! The ram isn't really mine to name since he is on loan, but I'm sure he'll pick up a nickname quickly if the breeder hasn't already thought of something! It will be exciting to have them around, and even more so to know that in five short months I'll be on lamb watch! Hopefully the ewes will come into season quickly so that the ram can breed them and I can have lambs in early May. The earlier in May the better since there is a weekend in April that I have to be out of town. Is it ridiculous that before completing my latest huge homesteading endeavor (to-get-sheep), I'm already considering my next? Of course this is insane, and I've always got several plans going at once, but I'm considering buying a plow and a tiller to be horse drawn. My horse Aoife is a great cart horse, and I keep looking at plans to make a stone boat so I can get her started on heaftier things, but it occurred to me (and naturally I'd have to clear this with the landlady, who may consider it too great a liability) that I could technically drive Aoife to my house, as she is kept at the horse farm where I run my lesson program, just two and a half miles from here. If Aoife came to visit for the day, I could have her plow for me, bring up firewood and do various tasks, before driving her home at the end of the day. It seems like a win-win for everyone, especially since Aoife is a very ... chubby ... lady, and almost never gets to enjoy grain with the other horses as a consequence, but these tasks would obviously warrent a grainy-sort-of-treat! Well it's been a long while since I've posted.. I've gotten tons done toward settling for the winter, and even more done toward bringing my sheep home. Theoretically they'll be coming home.......... *drum roll*......... tomorrow! I can't wait to have them munching away in their yard.